This article is written in collaboration with Lilya Kas'yanova. Lilya is not only an expert on Kyrgzy history and applied arts - she shares my interest in monumental art of the Soviet period. Bishkek is not the only Kyrgyz location where stunning examples of Soviet monumental art can be found. Throughout the countryside large scale works still stand, albeit often in deteriorating condition. The heyday of Soviet monumental art was the 1970s and 1980s. Apartment blocks and public buildings were often decorated in panels celebrating labour achievements, science, education and local legends. Professional artists were engaged to create these large-scale works, usually in mosaics, coloured plaster, stones and paint. This monumental art still reminds citizens of the former Soviet Union republics, and foreign visitors alike, about great achievements, grandiose performances, and ambitious might-have-been aspirations of the Socialist State. Here are some favourites outside Bishkek. One of the major goals of the USSR was health care for the working masses. Many specialised health resorts - sanitoria - were opened, focusing on disease prevention and treatment. Medical facilities were of high quality and free. Some of these sanatoria were embellished with stunning mosaics, murals and panels promoting a healthy life-style. 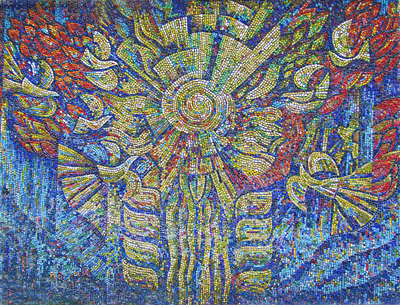 The mosaic detail above is in the grounds of the Tamga sanatorium. Tamga is a small village, 1700 metres above sea level. It is wedged between the Tien Shan mountains and shimmering Lake Issyk Kul. It was at this sanatorium that the first man in space, Yuri Gagarin, recuperated after his space flight. 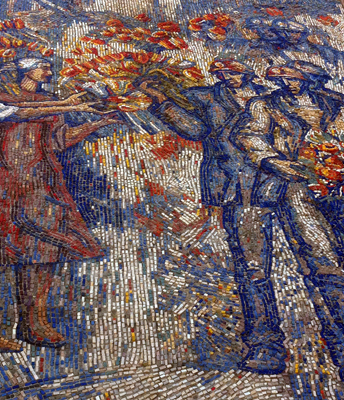 This very large mosaic is located prominently in the gardens of the sanatorium. I particularly like the image on the left side in which a doctor is checking the patient's pulse. Clients on an Uzbek Journeys tour stroll through the sanatorium's grounds and can view this beauty. 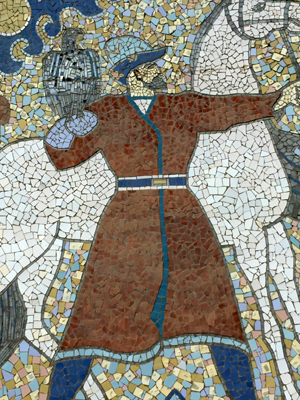 This enormous panel above - at least 12 metres wide - depicts a romantic Kyrgyz legend. It is inside the little-used auditorium of the sanatorium and is in pristine condition. Alamedin Gorge is 25 kms from Bishkek and lies at an altitude of 1870 metres. There is an abundance of natural mineral and thermal waters. A hot springs recreation complex threw its doors open to visitors in 1984; it was created at the initiative and with the active support of the Ministry of Power. 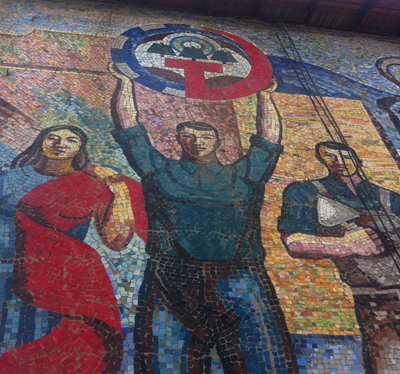 The image above is created on the facade of the indoor swimming pool - it is one of the most picturesque and last examples of Soviet monumental art. At the center is the sun depicting stamina and perpetual youth. From below the sun is supported by golden wheat, emblematic of fertility, renaissance, profusion and revival. Together they symbolise the "tree of life". Doves, images of longevity and harmony, fly toward the beaming sun. The turquoise and dark blue wavy lines, which build the background are associated with water – life and purification. Soviet sporting achievements also adorned original and motley monumental art. Sport was considered an indispensable part of everyday life, and "Homo Soveticus" had to be a many-sided individual, both intellectually and physically. Therefore, sport was a very important part of a citizen's development and upbringing. The 22nd Summer Olympic Games in 1980 were the first held in the USSR. 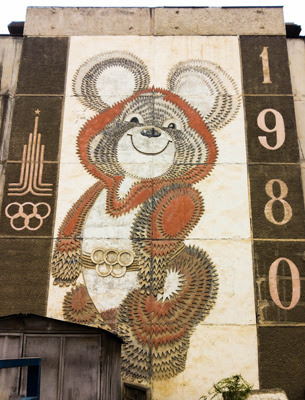 Mishka, the bear, was the mascot for these Olympics. He was designed by children's books illustrator Victor Chizhikov. Mishka was the first mascot of a sporting event to achieve large-scale commercial success. The Mishka doll was used extensively during the opening and closing ceremonies, he appeared on several products and had both an animated short film and a television series made about him. At left, Mishka adorns the side wall of an apartment building in Masaliev street in the centre of Osh, Kyrgyzstan's southern capital. It is not easy to spot and now ugly buildings start to block its view. 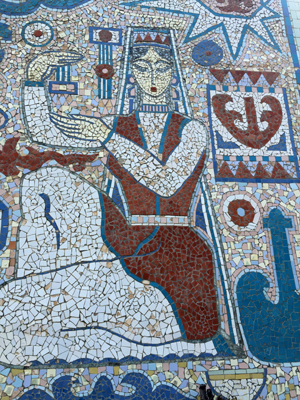 The detail below is from a huge mosaic covering the side of a five-storey building in Tash-Kömür town not far from the Uch-Korgon reservoir on the lower Naryn cascade. A major project in this region was the Toktogul dam and reservoir, the largest in Central Asia. Construction began in 1960 and the dam opened in 1974. On the road from Tokmok town to Kemin, is a derelict building in a field. In Soviet times it was a general store. Now the backyard seems to be used by a local family for storage. Covering an entire side wall is this marvellous Kyrgyz eagle hunter below, wearing a traditional Kyrgyz man's hat - a kalpak. On the other side wall, is a matching panel adorned with Kyrgyz traditional patterns. The woman is wearing a stylised, traditional Kyrgyz woman's hat - perhaps a shökölö, worn by brides on their wedding day or unmarried women on festival days. We believe these panels to be an important part of Kyrgyzstan's social history. If you find other examples either in Bishkek or the countryside, we would be very pleased if you send us a copy and a brief description of its location.